Megan Hobson was 16 years old when she was shot through the pelvis with a high-powered rifle. She was on her way back from her sister's birthday dinner when they heard what sounded like fireworks outside the car window, just behind the Miami Dolphins stadium. The bullet never left her body, it went through her right hip, ricocheted off her left, leaving fragments scattered between. Matt Gross was a rising musician in the 1990's traveling the world with his bandmates. They were atop the Empire State Building when he pointed out the Statue of Liberty to a stranger. Less than a minute later, the man opened fire, shooting Matt in the head through his frontal lobe. Sahar Khoshakhlagh was walking through Times Square with her cousin in the early evening for dinner and a show. 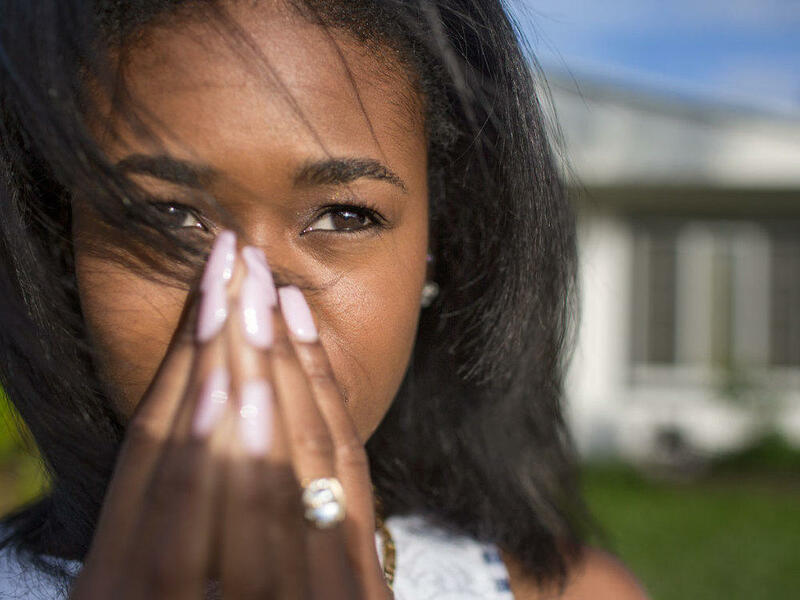 Caught in the crossfire of a police shooting, she only realized the bleeding after the chaos and dust settled. Although they all come from vastly different backgrounds and situations, each of them agree the person they are now is vastly different from who they were before the shooting. Kathy Shorr, a photographer from New York City, sought out to capture the people they are today. Over the course of two years Shorr photographed 101 survivors of gun violence at the sites of their trauma across the United States. The photographs of survivors like Gross, Hobson and Khoshakhlagh are published in her book "SHOT: 101 Survivors of Gun Violence in America." "The project is meant to be very diverse, there's a hundred and one survivors...many ethnicities, ages 8 to 80, high- and low-profile shootings – and also there are many gun owners," said Shorr. " If you looked at all 101 people and said 'well there's nobody like me' and 'I can't relate to any of those people' then I think you might be able to relate to the places where people are shot because most places are many banal, normal places that we frequent in our lives." Shorr learned this harsh reality of gun violence after a harrowing experience in her own home in New York. "I was robbed at gunpoint when my daughter was a little toddler...so I've had a gun pointed at me and the person that I loved most in the world – so I know that feeling of helplessness...just 'I'll do anything just leave, get out, just go. Take anything you want but just don't hurt us'," said Shorr. Shorr traveled 100,000 miles speaking to and photographing survivors across the country. Some she found through research, others found her. She read of Khoshaklagh's shooting in Times Square in a newspaper and ultimately brought her back to the scene to photograph her. In Shorr's photo of Khoshaklagh, the bright lights, bustling crowds and deafening noise blur into the background, forcing the eye to fixate on Khosaklagh's face, held high above the chaos but undeniably pained. "At first I kept just being like 'oh i hate this picture,'" said Khoshaklagh. "It dawned on me that the reason I don't like that picture is because it really showed my vulnerability and...I'm supposed to be you know the professional, and I'm supposed to have it together and that picture just showed my vulnerability and my suffering and it was really hard for me to see that." Khoshaklagh was fortunate to escape the police shooting with only a graze from the officer's bullet, but the mental burden of the shooting remains with her. The officers that night were aiming for a mentally ill man trying to throw himself into traffic. Khoshaklagh, a mental health practitioner, became an advocate for increased police training on how to de-escalate high-pressure situations with those suffering from mental illness. Megan Hobson read about Shorr's work online and reached out to with her own story. Hobson speaks openly about her own mental health struggles, hoping she can help others, especially youth, struggling with trauma. "You know what it looks like in that dark corner, because you've been there. And you often wonder what about the people who don't come out of that? This [shooting] didn't kill them but the mental after the fact did...because that's really what's heavy, the mental part of it," explained Hobson. The mental struggle Hobson describes is not a rare occurrence for gun violence survivors. After Matt Gross was shot in the head, he lost much of the person he was before. Palestinian shooter, Ali Abu Kamal, 69, opened fire atop the Empire State Building in an act of pre-9/11 terror targeting Americans. Six people were shot including Gross' guitarist, Chris Burmeister, who died after the bullet from Kamal's .380 Beretta semi-automatic handgun pierced the back of his head. Another bullet pierced Gross' frontal lobe, entering through the right side of his head, exiting through the left. "I'm just not the same anymore, I'm a new person, I have a new life and it's nothing like it was before," said Gross. "I've written over 500 songs and if I'm lucky I can remember the words to maybe 3 or 4 of them." The frontal lobe plays a critical role in short-term memory, tactfulness, personality, among many other functions, but Gross says that one of the worst parts about the aftermath is not his own physical or mental trauma but its larger impact. "I feel so much worse for the families than the brain-injured person, I mean my life had been very hard but when I think about my parents, friends, girlfriends I've had, I feel terrible for them...it's not just the person it happens to, but it's everybody who knows that person," said Gross. "They lost somebody." Dr. Tanya Zakrison, assistant professor of surgery at University of Miami, sees gun violence patients daily at Ryder Trauma Center at the University of Miami/Jackson Memorial Medical Center. Zakrison stresses the importance of behavioral and psychiatric therapy after trauma, as many victims of gun violence deal with post-traumatic stress disorder. "It's not just the patients that are developing post-traumatic stress disorder, it's their family members as well or their friends," said Zakrison. "They themselves have already been affected by violence or they've seen other loved ones so you don't actually have to personally be hurt yourself to develop...acute stress response or post-traumatic stress disorder." Hobson's PTSD is invisible to the eye but contributes to her pain all the same. Hobson needed over 30 units of blood, 400 stitches, over 20 staples and was put in a medically-induced coma. She was not expected to make it past the 48-hour mark. Severe nerve damage leaves her unable to feel below her left knee and requires her to wear a brace when walking. But it's the everyday implications of those injuries that pains her constantly. She misses wearing heels, cheerleading, going out past midnight, being able to say 'yes' on a whim to plans without worrying about having to explain her PTSD. "I don't remember what it's like being Megan before the shooting, I just don't...like it seems so far gone to be able to twinkle my toes...sometimes I look down and that's all I want to do and then there are other days that I look down and I wish my feet weren't connected to my body because they cause me that much pain." The detective on Hobson's case said she was caught in the crossfire of a "gang initiation retaliation." Her case was filed inactive within a year with no leads, a testament to the volume of gang violence in urban centers. Zakrison refers to the root cause behind cases like these as "structural violence." As a trauma surgeon in Miami, Zakrison says they see at least 1-5 victims of gun violence a day. "It's more infrequent to have a day where you don't see gun violence than to have one when you see it, which is the sad reality of it," said Zakrison. Zakrison studied public health at Johns Hopkins and was trained in surgery in Miami where she ultimately returned to practice after seeing how pervasive the issue of violence was. "Structural violence or these barriers we have...end up leading to direct violence because people don't have access to medical care, they don't have access to opportunities to gain full employment," said Zakrison. "If people are alienated and marginalized...if they're pushed out of the mainstream ways of earning a livable wage and developing their human potential..then they're going to turn to despair and other ways of surviving." The intention of Shorr's work is not to provide a political or divisive perspective on these systemic issues, but rather to start conversation around the stories of gun violence and survivors. Shorr hopes that the simple act of dialogue will help heal and foster greater understanding. Hobson's face is the cover of Shorr's book, but she hopes when people look at her face that it triggers a deeper curiosity about gun violence and the survivors' stories. "I personally don't just see myself, I'm looking at a hundred and one," said Hobson. "I'm looking at all the tons and millions of people that are out here everyday... that are wanting to talk about it or just thinking about it or they see it on the news...but they don't know what happens to the survivors. Who's gonna go find out?"